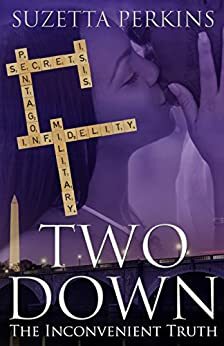 Two Down: The Inconvenient Truth, written by Suzetta Perkins is a book which draws the reader into an entangled mess of classified government secrets and the trials and tribulations of military relationships. Military wife Persenia is married to Brigadier General Reggie, who’s been committing adultery for years, and she’s just about had enough of it. Fueled by a meeting with the woman she suspects to be his lover, she vows to divorce him and drag his name through the mud. But, this is all before he is called away on urgent business in the Middle East, where ISIS are increasing their presence. Perkins narrates the story from a number of different viewpoints – mainly Persenia’s, but also from Reggie’s and Rasheed – a terrorist. The relationships are complicated and fiery, full of arguments and strife. Without the different narrators, it would be hard to keep up – but the variety allows a range of different perspectives. It doesn’t stop readers being on Persenia’s side though and feeling sorry for the women of the story, who are regularly messed around on by their husbands. The book is an emotional one, powered by lots of strong feelings – thoughts of jealousy, revenge, and anger. But through this, we can see there had once been a lot of love in the ruined relationships, and can’t help but feel sad at the loss. Throughout, it’s easy to find yourself getting involved, which is a testament to how well the book is written. There does seem to be a light at the end of the tunnel with a suggestion of real love forming, amidst a story full of unhealthy relationships and immoral behavior. Alongside the emotional turmoil is the contrasting stoic, male-dominated world of the military. Persenia is known for her upstanding reputation as a wife and party planner and has been Reggie’s rock, supporting him whilst he has built his career. This draws a comparison to what occurs behind different types of closed doors – such as people’s homes and in classified military offices. To the people looking in, Persenia and Reggie’s relationship is perfect and strong, and the government officers are handling the issues in the Middle East. From the outside, it all seems to be in hand. The issues that face military wives are highlighted – the extensive adultery, emotional and physical abuse from dominant men who are used to getting their own way. Persenia’s character also draws on the isolation that a military wife might feel, as she is moved from place to place as her husband is posted all over the country and overseas for months at a time. Perkins’ book is a story of intrigue – you really want to find out if the characters will reconcile and how they will react when all is revealed. It runs alongside a mysterious terrorist plot that adds pressure to the boiling relationships and forces the plot lines to meet and come to blows.